AMSTERDAM вЂ” Gemalto, the world leader in digital security, today announced the launch of a new virtualized network encryption platform, SafeNet Virtual Encryptor CV1000 as part of its continued investment to address the rapidly changing data security needs of organizations worldwide. Leveraging the proven security and performance of the hardware-based SafeNet High Speed Encryptor family, the SafeNet Virtual Encryptor CV1000 is a hardened virtual security appliance designed to secure data in motion across both software-defined wide area networks (SD-WAN) and traditional networks. Developed by GemaltoвЂ™s high speed encryption partner, Senetas (ASX:SEN), the SafeNet Virtual Encryptor CV1000 can encrypt data in motion at data-rates up to 5 Gbps. вЂњAs organizations increasingly embrace cloud-based applications and their use of multiple network types from Ethernet to MPLS, Senetas and Gemalto are ahead of the curve in providing seamless concurrent multi-layer network traffic encryption to ensure the best in network security and performance available today,вЂќ said Andrew Wilson, CEO of Senetas. Webinar: Gemalto will host a webinar entitled, вЂњNetwork Encryption at the Flip of a Switch: Implementing Virtualized Network Encryption to Secure SD-WANsвЂњ, on June 21st at 3pm Central European Time. Click here to register. 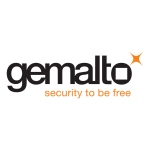 Gemalto (Euronext NL0000400653 GTO) is the global leader in digital security, with 2017 annual revenues of в‚¬3 billion and customers in over 180 countries. We bring trust to an increasingly connected world. GemaltoвЂ™s solutions are at the heart of modern life, from payment to enterprise security and the internet of things. We authenticate people, transactions and objects, encrypt data and create value for software вЂ“ enabling our clients to deliver secure digital services for billions of individuals and things.